This week’s post is the final in a three-part introduction to the formal language of energy, as a foundation for subsequent discussion about just what it is that the energy concept deals with. These posts are intended to provide a set of reference points for later inquiry into the higher-level relationships between energy and societal futures. A central purpose of the approach I’m advocating is to maintain a connection between our understanding and use of energy-related concepts, and day-to-day experience of our physical world. It’s my contention that we might then be better placed to appreciate and respond to the societal dilemmas we’re confronted with through clear eyes—as free as possible from the fog of confused conceptions. In Part 1, I presented an introduction to systems ideas as a way of thinking about any situation in which we’re interested, and then went on to introduce the first of three foundational energy laws, energy law 1 relating to energy conservation. In Part 2, I looked at energy law 2, relating to energy dispersal. In Part 3 the focus is on energy law 3, sometimes paraphrased as the ‘economy law’. I’ll wrap up the series with some brief comments on what this all implies for the way that we think about energy and how this will prepare the way for subsequent inquiry into energy and societal futures. The last of the three foundational laws might in some respects be considered the most experientially obvious, while at the same time being the most challenging to deal with in the formal conceptual language available to us. This will bear further consideration down the track, as we look at the consequences following from the high level of abstraction involved in dealing with energy ideas. Given that in this post it’s the conceptual treatment we’re focusing on, this section will necessarily be the most arduous in terms of the formal ideas and language that we need to deal with—in fact I’ll need to resort to a mathematical function or two; there are also a couple of graphs coming up to represent the ideas. In discussing energy laws 1 and 2, I’ve been drawing on two main disciplinary areas within physics, classical mechanics and thermodynamics. While the concepts and terminology we’ve been dealing with are common to all of the physical sciences, they arguably find their most practical expression in terms of social implications within the discipline of thermodynamics—the science of heat, work and the properties of systems. Given my engineering background, this is perhaps the area of energy studies in which I’m also most at home: in a mechanical engineering context, the study of thermodynamics is all about the energetics of doing socially valued and useful things. This background has provided a particular stylistic accent to the presentation of ideas so far. In this final post in the series, we’ll be making a shift away from the thermodynamic approach to energetics—keeping in mind that everything we’ve looked at to date is still entirely consistent with the approach we’ll focus on here, and is in fact grounded in it. To deal with energy law 3, we’ll draw specifically on the more fundamental perspective of classical mechanics. Classical mechanics is the foundation of physics; it’s the first area to which any student of physics is introduced (and for which all physicists would be expected to develop a requisite degree of mastery). For anyone who has studied physics at secondary school level, either as part of a general science subject or in its own right, this is where you will have started. In a sense, classical mechanics is about the physics of everyday things and events at the human scale, and so it’s natural that this is where disciplined scientific inquiry into physical phenomena commenced, and hence where the foundations for physics were established. With this shift noted, an observation—and an admission—might help with getting a better sense of how the terrain that we’ve been traveling across has become progressively more challenging as we’ve proceeded through Parts 1 & 2 over the past two weeks. In looking at the three fundamental energy laws, we started with the conservation law, then moved on to the dispersal law. We’re now looking at what might be termed the economy law: in a spontaneous physical process, not only is the total energy conserved, but the amount of action that occurs—what actually happens as energy disperses—is the least of all possible happenings. My observation is this: the highest level at which I’ve studied energetics in a formal setting is in final year undergraduate engineering; even so, I managed to graduate without really appreciating this foundational law and what it deals with.Note 1 I don’t think this was simply a result of not paying attention—as far as I can make out, it just didn’t occupy such a prominent place in the ‘ecology of ideas’ into which I was being inducted, at least not in a way that was transparent at the time, or to an extent equivalent to that of the other governing energy laws. The formalisms associated with it were certainly part of the syllabus, but I didn’t connect this with an appreciation that the maths related to something as fundamental as a ‘foundational law’ of energy. This is especially noteworthy given the appreciation that every engineering graduate could be expected to have for the conservation and dispersal laws and their significance—it would be difficult to come away from a four year engineering degree without knowing that these were fundamental, even if they remained difficult to grasp intuitively. The principle of least action, as the third foundational law is referred to in physics, is on the other hand well appreciated by physicists—it plays a central role in modern physics, and provides a bridge between classical mechanics, relativity and quantum mechanics. In fact, for physicists, the order in which I’ve introduced the three laws may seem a little odd, since the principle of least action is often regarded as the most fundamental physical principle. In a sense, it marks a point of departure between lay-understanding of energy principles, and the more specialist understanding required for the work of modern physics to proceed. Many people without a background in science and engineering are familiar with the energy conservation law, and at least have a passing awareness of the second law of thermodynamics. On the other hand, a real appreciation for the principle of least action seems to be largely restricted to trained physicists, or at least those with a special interest in physics. This latter group would certainly include many engineers, but it’s probably fair to say that most engineers graduate without this deeper appreciation for theoretical foundations. I wonder though if omission of the ideas that the principle deals with from less specialist studies may be a significant barrier to better appreciating what it is that the energy concept actually deals with more generally. Presumably this omission occurs ‘because the maths is hard’. If this presumption is a reasonable reflection of what’s going on, we may be missing something important by allowing the complexity of our formal language about the world to dictate the structure of our learning systems. As the language that I’ve used in the title for this section perhaps hints, it’s here that we really start to connect back to the flow of physical events—‘things happening’ might be another way of putting it. There may be an important role for these ideas in building the connections between abstract energy concepts and our concrete experience in a way that would make those concepts more transparent to us and more effective in guiding societal futures. Let’s start this final discussion by returning to our earlier example, and asking a question: how can we account, in energy terms, for the bottle in our chair-floor-bottle system following the particular trajectory—the change in height with respect to time—that it does when it falls from the level of the chair seat to the floor? Moreover, why is it, again in terms of the energy concept, that spontaneous physical processes tend not to surprise us, or put another way, tend to follow unremarkable trajectories? Energy law 3 deals with such questions. While energy must always be conserved, and will always tend to disperse unless hindered from doing so, the trajectory that the system follows between its start and end points in space and time as the energy disperses will also be the one for which the action is the least of all possible paths. The difficulty that arises in dealing with this relates to the way that action is defined in formal terms—i.e. mathematically—as the expression for this is more complex—and perhaps less intuitively obvious even for trained physicists—than those for energy laws 1 and 2. The actual physical behaviour that this deals with, on the other hand, is intuitively obvious: in our very simple example, the bottle falls to the floor by the most direct path, with a smooth and continuous motion without disruptions, just as our experience would suggest that it should. We can imagine infinite trajectories that a system could follow between a start and an end point in space-time; the system, though, must adhere to this third energy law, which precludes all but the actual trajectory that the system takes. This mathematical expression stands for ‘The action is equal to the integral of the difference between kinetic energy and potential energy with respect to time’—you can perhaps better appreciate now why this is regarded as so conceptually challenging. The path that a system will follow in changing spontaneously between two states is that for which the action, S, has the minimum value. The unit for S is J.s or joule-second. Obviously, this is a big technical step up on the discussion in Parts 1 and 2, commensurate with the challenging nature of the action concept itself. We can perhaps get a better handle on this though by tying the conversation back to our very simple example system. I’ll do this via a series of graphs (I do appreciate though that this might not be a great help to readers not used to visualising things in this way). 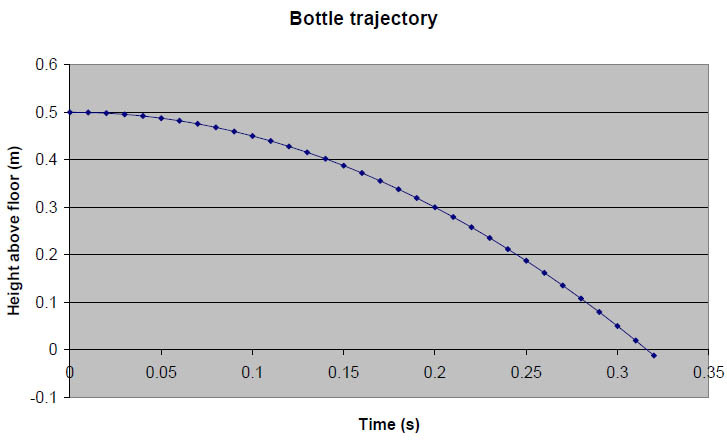 The first graph below depicts the actual trajectory followed by the bottle as it falls from chair height to the floor. Trajectory here just means ‘the height of the bottle above the floor at every time between starting its motion and reaching the floor’. For a simple system such as this, given that the physics is very well understood, we can work out the bottle’s equation of motion with respect to time by, in effect, calculating where the bottle moves to in the time instant after it is released, and the instant after that and so on until it reaches its destination (the floor). Once we have the equation of motion, we can calculate the height of the bottle at any time, t, after it is released. So in our example situation, we know from the outset what the trajectory should look like, and how the actual bottle would behave in practice. This allows us to plot the trajectory, as roughly illustrated in the sketch below. Of particular importance, we now know the position of the bottle at the start and finish of its motion (this is obvious and trivial—the system behaviour that we’re interested in is the movement of the bottle from chair height to floor height), and we know that the motion finishes approximately 0.32 seconds after it starts (tf on the graph). Because we’ve fully described the trajectory—we have an equation that can give us the height at any time between start and finish of the bottle’s motion—we can also calculate all of the relevant energy functions: kinetic energy, potential energy, the system’s internal energy, and the Lagrangian. Each of these can be expressed in terms of, or as a function of, time, and plotted on a graph. This is illustrated in the sketch below. The curves marked as potential energy and kinetic energy simply describe the changes in those quantities as the bottle drops from chair seat height to the floor: at the start, kinetic energy is zero, potential energy is 5 J. At the end (time tf, approximately 0.32 s), just as the bottle reaches the floor, kinetic energy is 5 J, potential energy is zero. 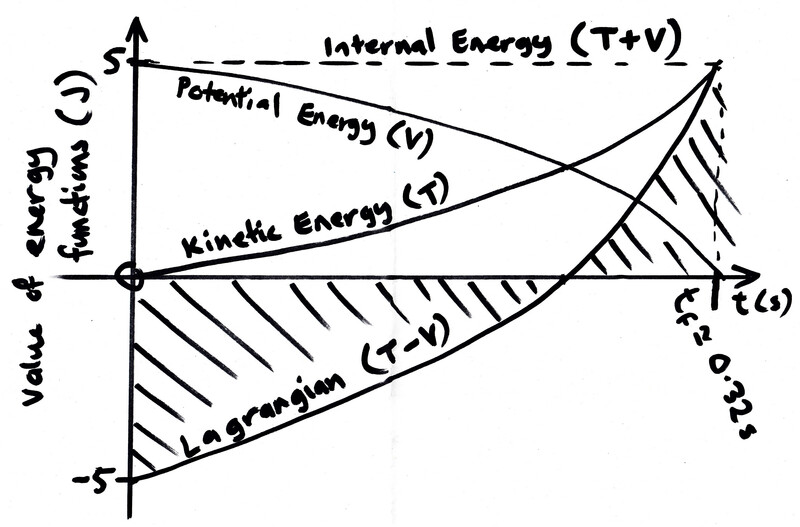 If we add up the values of kinetic energy and potential energy at all times and plot the resultant values on the graph, we get the horizontal dashed line marked as internal energy—as we expect, internal energy is constant, or conserved. By subtracting the potential energy from the kinetic energy at all times and plotting the resultant values, we get the curve marked as Lagrangian. This changes from -5 J at the start, to +5 J as the bottle reaches the floor. Now we get to the important part: the action is represented by the shaded area on the graph, between the Lagrangian or (T – V) curve and the time axis. The area to the left of the point where the Lagrangian crosses the axis has a negative value; the area to the right of this point has a positive value. Adding these two areas, we get a net area value representing the action. Given that the negative area (area below the time axis and to the left of the crossing point) is greater in magnitude than the positive area (area above the time axis and to the right of the crossing point), the overall action is negative. In our example, we started with an accurate description of what actually happens when the bottle is dropped, by working out the equation of motion. In effect, this approach involves working forward in time from the start point and asking repeatedly, for successive infinitesimally short time intervals, ‘what will the system do in the next instant?’, until the system either reaches a prescribed end-point, or until a prescribed time has elapsed. The difficulty with this approach is that the answer to the question ‘what will the system do in the next instant?’ is unique for each situation that we might look at. In a sense, solving every problem requires that we start from scratch. The great significance of the principle of least action, on the other hand, is the way that it allows the system’s trajectory to be approached ‘all-at-once’. Rather than, in effect, starting at one end of the trajectory and working our way forward until we have the complete path, we start with a complete path and ask ‘what happens if the path varies slightly?’, repeating this until a general condition is satisfied. This general condition is the principle of least action: for the actual trajectory, not only will energy be conserved, but the action will be at a minimum value. Whereas the ‘start-to-finish’ approach is unique for each situation, the ‘all-at-once’ approach is general for all situations. We use the same approach, regardless of the specific nature of the situation we’re dealing with. On this basis, we could have taken a very different approach to establishing the trajectory for the bottle. This alternative approach requires that we know only two things about the motion: its start and end points, in space and time. If we know by experimental observation that the bottle falls from its start position to its end position in 0.32 seconds—or, perhaps even more significantly, if we want to design a system that will achieve this as a pre-defined objective—it’s possible to imagine an infinite number of trajectories that would achieve this result. In the illustration below, two such imaginary trajectories are depicted, along with the actual trajectory for which we previously determined the equation of motion using the start-to-finish methodology. What we’re aiming to do with the principle of least action—or ‘all-at-once’—methodology is to find which one of the infinite possible trajectories is allowed. There are two techniques that we can take for this: we can go about it analytically, by solving a set of equations to arrive at the equation of motion directly; or we can go about it numerically, essentially via an iterative graphical technique—but this can be computer automated, and is hence also known as a computational approach. The former approach is well beyond the scope of this blog; the latter approach is by far the more intuitive and easy to follow—though even this is well beyond the level of technical detail that I’ll generally be aiming for once these foundational posts are completed. The numerical or computational approach can also deal with systems more complex than those for which the analytical approach reaches its practical limits. The key to understanding the numerical approach is to recognise that the actual trajectory for a system can be approximated by dividing it up into a number of discrete time intervals of equal duration, with the path for each interval represented as a straight line. The significance of these straight lines is that they represent a motion between the start and end of each interval for which the speed is constant, and hence for which the kinetic energy is constant. 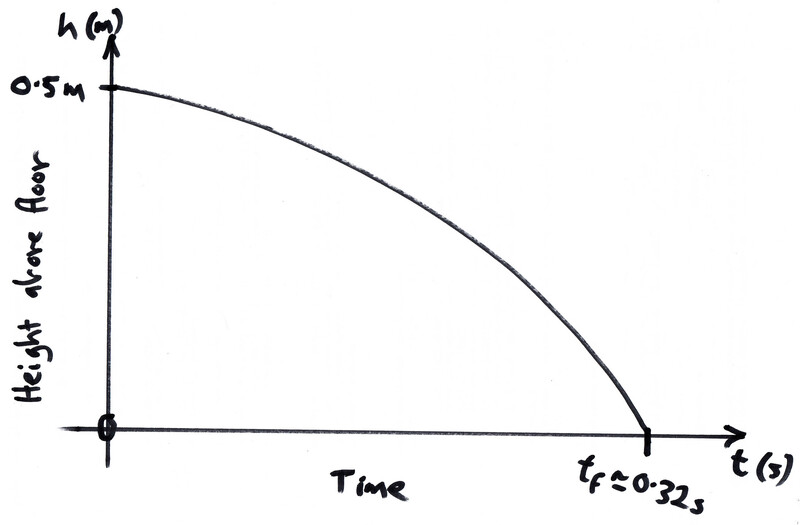 The graph below provides an example: this depicts the actual trajectory for our chair-floor-bottle system—the original smooth curve—as a succession of straight lines. We can now also note that the two alternative trajectories indicated above are extremely simple—they are based on a division of the observed time of travel into just one and two intervals respectively. By considering a greater number of time intervals, we could propose much more complicated trajectories; the greater the number of time intervals into which we divide the imaginary trajectories, the more accurately we can determine the actual trajectory. For now though, the very simple alternative trajectories will serve our purposes adequately. In very loose outline, the numerical approach proceeds as follows: 1) We propose an initial trajectory, for example the line indicated as Alternative 1. 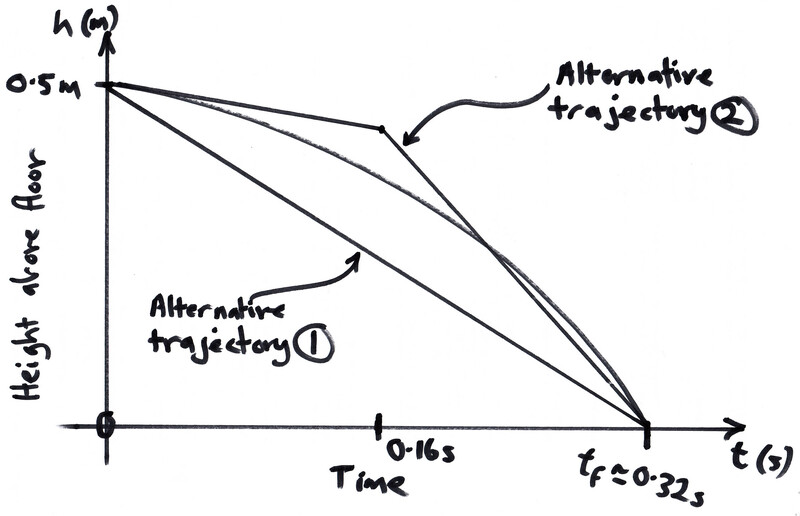 For this trajectory, we calculate the Lagrangian (the kinetic energy minus the potential energy) at the mid-point of each time interval, multiply this by the time interval and add each of these up to find the action for the entire trajectory; 2) We then vary this trajectory slightly (we might select something like Alternative 2 above), and repeat our calculations. The action will either be higher or lower than in the first step; 3) By comparing the actions for the first two steps, we can decide on the next trajectory to try—keeping in mind that we’re looking for the trajectory with the least action, and so we want to vary the trajectory in such a way that the action decreases with each iteration; 4) By repeating this process, we will eventually converge on the trajectory with a minimum value for the action; this trajectory will also have the same value of internal energy for each time interval. As we should expect, the actual trajectory has the minimum action value, and is also the only trajectory for which total energy is conserved. So the requirement that the action be minimised for the actual trajectory provides us with a powerful general approach to determining the trajectory for a system. Because the action is a single quantity describing a system across the entire path for a given change process, and because we know that it must be minimised, we can develop an ‘all-at-once’ view of all the possible trajectories that the system’s behaviour could take. That is, the action gives us a way to study and appreciate the situation in which we’re interested as a system—as a whole. What I’m hoping will come through with this—and this is my reason for having gone into energy law 3 in such (perhaps excruciating) detail—is the way in which the energy approach to understanding the physical world and the systems approach to understanding situations more generally are of a fundamentally similar nature. Appreciating this will set up a very strong foundation for looking at the problems we run into in the messy realm of human affairs when we forget—or fail to recognise in the first place—that when we engage with situations in energetic terms, we’re dealing with the resultant of a systems view. If we’re to deal more effectively with such situations, it will benefit us greatly to sharpen our capacities for thinking with systems. A central insight that I’m hoping readers will take from this series of posts is to appreciate energy not as an independent entity or substance-like thing, but as a property of systems defined by us. Further to this, we’ve seen that as a system property, internal energy—the sum of all energy associated with a given system—is a measure of that system’s capacity to do work or to transfer heat to other systems. We’ve seen that applying the energy view—the way of thinking about a situation of interest to us in energetic terms—first requires that we use a systems view to structure our understanding of that situation. The energy view is a whole-of-system or all-at-once view: pre-empting the next phase of our inquiry, it is about the relationships between things. Energy law 1: energy is conserved in an isolated system—though there is a continuous interchange between two types of energy—kinetic and potential—that together comprise the total or internal energy of a system, and which are not individually conserved. Energy law 2: energy tends to disperse from where it’s concentrated to where it’s more spread out, unless hindered from doing so; it’s as kinetic energy, the energy of motion, that this dispersal occurs, in a cascade from larger scale motion to smaller scale motion, with all energy eventually dispersing as the atomic and molecular scale motion know colloquially as heat. Energy law 3: as energy disperses, the action associated with the system change enabled by this dispersal is minimised; the difference between kinetic and potential energy for a system provides the means to ascertain the action of a system and hence to study the physical behaviour of a system as a whole. We’ve covered a lot of territory in these last three posts—involving perhaps as much effort in reading as there was in writing. The pay off though is that we now have in place an articulation of both basic energy concepts and basic systems concepts that is sufficiently comprehensive to support the principal purpose of our inquiry. Any further elaborations that we need along the way can now be brought in as needed, by building incrementally on this base. We’re also now in a very good position for taking a step back and asking the question: OK, so now that we’ve got a handle on energy as a concept, what exactly is it that this concept is dealing with? In other words, we can now begin the process of linking the formal knowledge structures to the phenomenal world of day-to-day experience, and in doing so hopefully get a better sense of what this energy idea is all about. This will also allow us to build a full appreciation of just how abstract the energy concept is, and look at the implications of this for how we use it—along with the problems that this leads to at the higher level of social and economic concerns. In due course, we’ll look also at what it means to regard these as ‘higher level matters’. Note 1 My own appreciation that the insights described by energy law 3 really ought to be elevated to a status alongside energy laws 1 and 2 (and in important respects is even more fundamental than them) solidified relatively recently, on reading Jennifer Coopersmith’s history of the energy concept’s emergence, Energy: the Subtle Concept . Had I not had the good fortune to learn of this book just before it was published, I’d very likely have covered only energy laws 1 and 2 in these posts. In many respects this would have been adequate for coming to terms with energy as an abstract concept; what it would have missed, however, is an important means for bridging between the concept and the phenomena to which it relates. The order in which I’ve presented the laws also reflects Coopersmith’s own summary in her concluding chapter. And a little further along, we’ll hear more from Jennifer Coopersmith as we grapple with the connection between energy as an abstract concept, and what it is ‘all about’ in terms of our experience of the world. Note 2 In physics, potential energy is often designated as U; the ways that letters are used differently to designate quantities across disciplines can be a source of confusion, for instance in thermodynamics U is reserved for internal energy. I’ve used V here for potential energy as this was Lagrange’s original designation. This is arbitrary though—provided consistency is maintained for the given situation. This is again an instance of a systems approach—our particular usage is right or wrong only relative to the local system that we’ve defined, in this case a system of symbols representing variable quantities. Coopersmith, Jennifer (2010) Energy: the Subtle Concept, Oxford University Press, Oxford. This entry was posted in Foundational ideas and tagged conservation, dispersal, energy laws, least action principle, systems view by Josh Floyd. Bookmark the permalink.